Bernice Ende is riding around the Western United States! 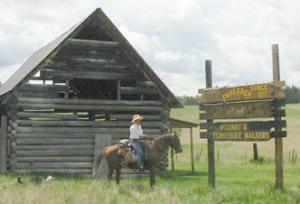 Bernice Ende, from Trego, Montana, has completed her 5,000-mile journey around the western United States with her 8-year-old Thoroughbred, Honor, and her dog, Claire. "Oh how can it end? Did we really travel 5000 miles, me, my horse and dog? Indeed — even I shake my head when I turn in the saddle and look at the long ribbon of road behind us. We arrived in Trego, Montana Friday September 22, 2007 ending our second long ride. 5000 miles stretched through 14 states across the Midwest. Down to the deserts of Arizona into Death Valley up the Sierra Nevadas and Cascade mountains to the Pacific ocean., and home through Eastern Washington, the Idaho Panhandle into our beautiful NW Montana country. l6 months. 14 sets of horseshoes, 12 pair of dog booties. Thankful to have arrived warm safe and dry. Words I repeated many, many nights on my journey. I am not sure how to end this all and I suppose in many ways I am not, as I have already set in motion plans for next year’s ride. But here and now is the time to extend to all of those whose generosity, curiosity and kindness helped to make this all possible. From my dear sister Katheryn who lent me the money to buy my brave steed Honor to Russ Barnett (OUTFITTERS SUPPLY) who fitted us out with high quality gear. To Billy Harris who set up the web site to Lynn Foster (also from Outfitters Supply) who was kind enough to keep it current. To all of the 1000s of hand shakes and friendly smiles. To the words of encouragement, hot meals and hot showers. To all of you that stopped on the road to visit - you embellished the ride. I am returning from this ride with a far greater appreciation for our country then when I left. I have seen in my opinion the best of America, our small towns, communities, National forest. Places and faces that reflect the goodness of our country, the beauty of our country, the diversity of our country. It was touching, it was moving, it is something we take for granted much too often. I believe the Long Rider represents freedom. It represents a quality of time and space the human spirit is and always will be hungry for. I felt, even on my most difficult days, grateful, fortunate — privileged to be able to ride a long ride. It has become for me a way of life, not simply a once in a life time dream as it is for so many. 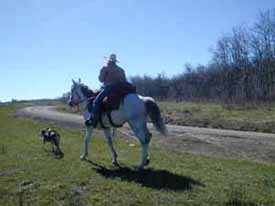 As I have said many times before 100s and 100s of kindred spirits ride in the saddle with me. They encourage me to continue to ride and to share these remarkable journeys as a Lady Long Rider. I don't think I can say thank you enough but I will keep on saying it. To all of you-- my heartfelt thanks, Happy Trails and see you again next year Bernice Ende"
The great Swiss Long Rider, Madame Catherine Waridel, though only 4' 8" tall, rode 8,000 miles alone across Central Asia. She is the one who said, "Being a Long Rider is more than just a matter of miles. It is a question of honour, dignity and behaviour." As if to demonstrate the wisdom of Madame Catherine's words, we present this link to Bernice Ende, whose courage and kindness epitomize the values symbolized by The Long Riders' Guild. For more information, please go to Outfitters' Supply, who have been a great help and support to Bernice, or to Bernice's own website, Bernice's website . Here is an article about Bernice from The Record Courier in Douglas County, Colorado. Please click here to learn about Bernice's 2008 Long Ride. Two year earlier, Bernice and her mount, a Tennessee Walking Horse named Pride of Ribbon MCC, completed a journey from Montana to Albuquerque. "I think it's so important that women know they can do anything," Ende said in an interview with the Tobacco Valley News. "Maybe this is a way of saying to myself and other women, go and ride your dreams." Congratulations, Bernice, to you and Pride - and also to O.V. and Evelyn McCurry who bred the brave horse. Please click here to go to Bernice's website.